Piclopedia will make these inventions and instructions on how to build them widely available to developing world farmers and artisans. Step one is to transform the old drawings and instructions into explicit pictorial plans that anyone can follow irrespective of language and literacy, and to put them on the Piclopedia.org website. Step two is to provide local Piclopedia activists/partners the wherewithal to compose loose-leaf binders of the laminated designs/instructions that are appropriate and popular in their regions, and to distribute the binders to, e.g., schoolteachers in villages. The schoolteachers would become lending librarians of the designs/instructions. Step three is to make it possible for farmers to provide feedback in their own languages. They will be able to describe how they adapted designs to their locally available materials, their proper use, and share ideas and knowledge in other areas, including animal husbandry, crop practices, or whatever they in their collective experience consider relevant and important. There also exists the possibility of technological convergence between our efforts here and the various new technologies that are rapidly spreading in the developing world, including cell phones with big screens capable of displaying diagrams, photos, and videos; PDAs; and $100 laptops. 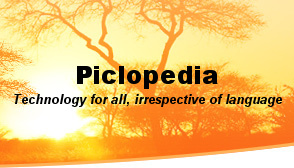 Piclopedia may also be able to hitch a ride on other information creation/distribution services such as eGranary, a 500GB repository of educational material that frees universities in the developing world from needing to pay for bandwidth, and Digital Green, a participatory framework for agricultural extension backed by Microsoft Research-India. These are just a few ideas; I'm positive that many more will be generated. My vision is that this will be a completely open-source project, with only loose supervision to maintain quality, strategic direction, preserve finished products, and reduce unnecessary duplication of effort. This project may not stir you personally to involvement, but you may know someone who may know someone who may be interested in participating. To provide a way for such people to get to know each other and to interact, I have started a networking site at www.piclopedia.ning.com. It will be a place to share ideas, generate strategy, prioritize actions, list tasks, and generally oversee the creation of the Piclopedia website here. Please review the materials here and think about whether anyone you know might appreciate hearing about this project and/or might have a technical skill that could be useful. And then please direct them to this site!